Our basil was super late growing this year. Earwigs ate the first lot of plants, and the second lot took a while to get going. We even ended up buying several batches of basil to cook with because we didn’t have any in the garden. At long last however, the basil plants are full of leaves. Just in time for the weather to turn cold and the frosts kill them. I wanted to save as much of the basil as possible to use over the winter months, so we picked a large bowl of basil leaves. I then pulled all the leaves off the stalks and put them in a food processor. After giving them a quick wizz, I poured some olive oil in to loosen the mix. For every cup of leaves (packed in well) add about 1/4 of a cup of oil. Once the leaves are processed, spoon the mixture into ice cube trays and freeze for several days before turning out and popping in a snap lock bag. 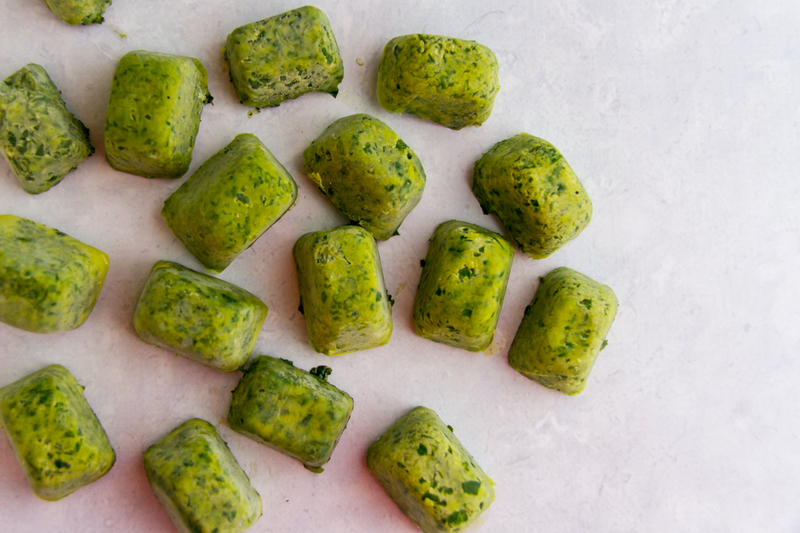 When you need some fresh basil in you cooking, just grab an ice cube or two and whack it in. Delicious fresh basil flavour all year round. 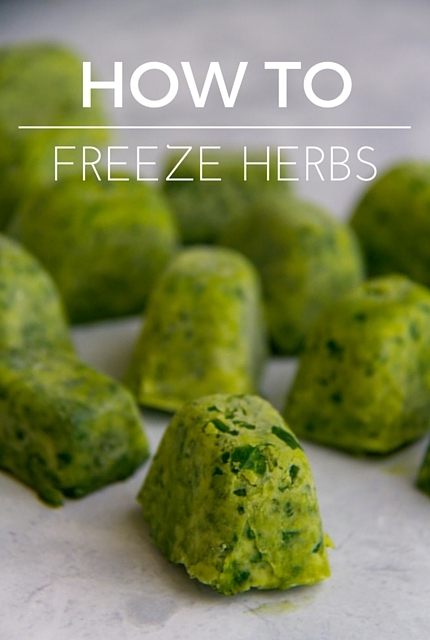 This method works well with any soft herb such as parsley, coriander, fennel, thyme, or oregano. Herbs like rosemary, which are woodier, still work, however their texture in the final food is sometimes a bit lumpy and woody. Hi Wendy, I haven’t frozen basil straight for a few reasons. The leaves would be damaged by the ice crystals and would black and sludgy when they defrosted. They would still be fine to use in cooking. Freezing the individual leaves like that would not be a very space efficient method of freezing them either. If you don’t want the oil, you could try blanching the leaves quickly, and then freeze them. 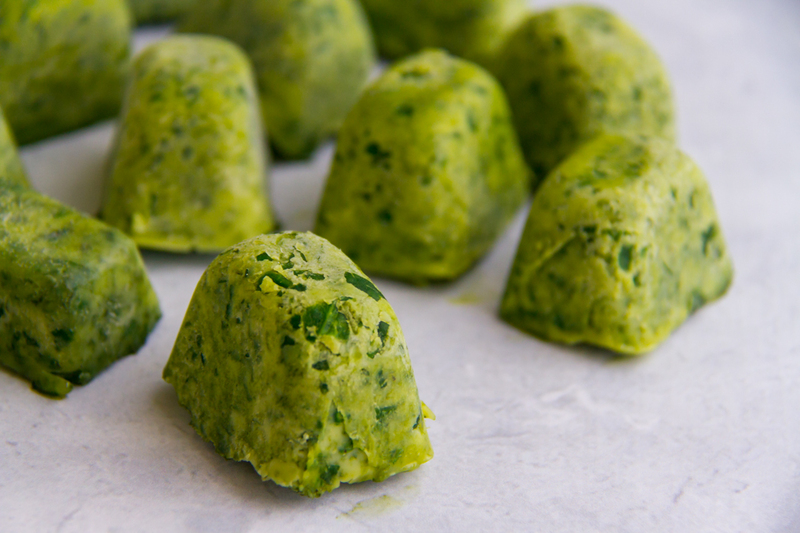 I imagine that they would be similar to frozen spinach in appearance and texture. Let me know how you go! Pesto is another way to use it up.